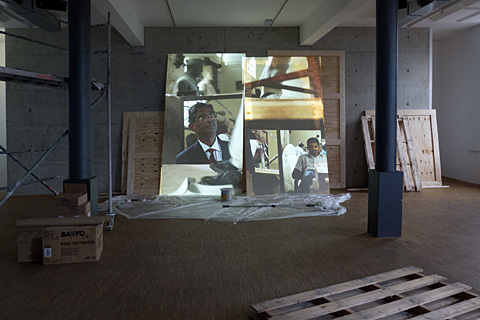 Kassel: On view at the latest installment of dOCUMENTA is a video installation by artist Bani Abidi. The project titled ‘Death at a 30 Degree Angle’ was commissioned by the Sharjah Art Foundation and will be on display in Kassel until September 16, 2012. The installation is a film broken up into three separate projections being screened on planks resting against the wall. Set in India, it is a fictional account of a politician who has commissioned a statue of himself but is unable to settle on the right costume to ‘represent’ himself. Abidi’s project is inspired by the book, ‘The Emperor: Downfall of an Autocrat’ by Polish journalist Ryszard Kapuściński, about the decline of the Emperor of Ethiopia – Haile Selassie. The dominant themes in this work work are those of megalomania and the obsession with posterity. Born in Karachi, Bani Abidi went to study in Lahore and later in Chicago. Initially practicing as an installation artist, it was her time in Chicago and exposure to film that inspired her to shift to video art. In an interesting interview with the National Gallery of Victoria, Abidi talks about the significance of her cultural location in her artistic practice.